How typhoon aid organizations spend your cash donations. You’re still helping victims and saving lives. 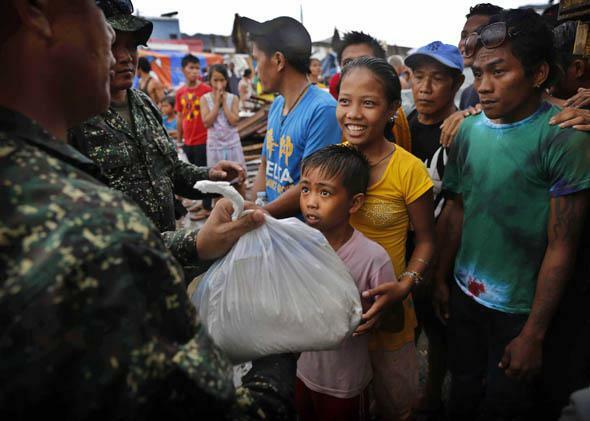 A young Filipino girl and her brother receive their first bag of food aid in the aftermath of Typhoon Haiyan. Money that goes to operating costs or overhead make this possible. But other readers outside of the aid industry were still not convinced. “Money lines the pockets of corrupt politicians and agencies,” they wrote to me. “All the money goes to pay agency expenses,” they commented on Facebook. “So few of those charity dollars actually make it to those who need it,” they posted on Twitter. It’s certainly frustrating and overwhelming for people who want to do the right thing after an emergency of this magnitude. There are dozens of agencies clamoring for attention and donations. I won’t say that there haven’t been instances of aid corruption in the past, nor will I claim that all of the money you donate is going directly to a family in need. But if you give responsibly, your money will end up doing tangible good. And it’s important to remember that, when you contribute, you’re giving to a larger humanitarian response, not necessarily an individual disaster victim. Many people reluctant to give money seem perturbed by agencies spending donations just to keep the lights on. What’s important to remember is that dollars that go to operating costs or overhead make up a vital part of the response that is vastly more expensive than it is under normal circumstances: communication through satellite phones and Internet when traditional lines are out, renting cars which are less available and more costly after a crisis. Dollars given to overhead are also spent on obtaining basic items like fuel, so that humanitarian responders can deliver assistance by truck on the broken roads, or by helicopter over them. The affected area in the Philippines has a geographic footprint that would stretch from Florida to Canada, and is composed of many islands, each of which has seen basically all of its infrastructure destroyed. As difficult as the Haiti earthquake response was, there were still parts of the country that were not affected, and some of those displaced in the cities could, resources permitting, opt to return to their home communities where the living situation was better than in the cities. In the Philippines, the wide swath of the typhoon made such oases few and far between, and makes reaching all of those in need a logistical nightmare. Using money to purchase fuel also keeps organizations’ generators on so that aid workers can toil through the night organizing distribution and maintaining records of where the greatest needs and vulnerabilities are. It means that staff can work on all cylinders when they face obstacle after obstacle like they are in the Philippines. If you’re still not convinced that your financial donation will make a difference, you can do some extra homework before you make a contribution. Identify agencies that are transparent about how they spend their funds and can account for them. Investigate how the agency has performed in the past—evaluations are easy to obtain online. 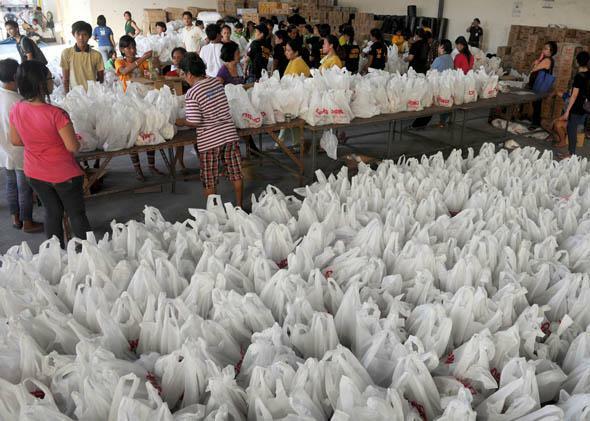 Volunteers repack relief goods at the Department of Social Welfare and Development in Manila on Nov. 14, 2013. It’s also important to know that you can wait to give your donation. You don’t need to give money right now. The affected areas in the Philippines will take time to rebuild. If you have the urge to give money now, do so. But it’s also OK to wait a few weeks, after the cameras turn off but when long-term recovery for Filipinos is just beginning. See what agencies have been able to achieve by then. You’ll be in a better position to evaluate performance and what is needed. We often overlook the fact that the first responders in any crisis are friends, neighbors, community members. Filipinos have been dealing with typhoons their entire lives; they know better than anyone how to pick up the pieces after the storm. And local networks, systems, and civil society organizations are helping them do so. You can directly support these by providing money to the National Disaster Risk Reduction and Management Center, the Department of Social Welfare and Development, and the Philippine Red Cross. Don’t be afraid of overheads. Don’t be afraid to wait until things have settled a bit to see more clearly which agencies are performing well. Don’t be afraid to give locally. Do your homework before you donate and contribute responsibly. And on behalf of aid workers everywhere, thank you for your contribution.